Varanasi, March 20: After Congress General Secretary Priyanka Gandhi Vadra garlanded a statue of former Prime Minister Lal Bahadur Shastri, workers of the Bharatiya Janata Party (BJP) 'purified' the idol with Gangajal. As part of her 'Ganga Yatra', Priyanka Gandhi visited the Shastri Memorial at Shastri Chowk in Ramnagar and paid floral tributed to the later prime minister. She garlanded his statue installed there. After Priyanka Gandhi left, a group of BJP workers arrived and washed Lal Bahadur Shastri's idol with Gangajal. A minor scuffle also broke out between Congress and BJP supporters while Priyanka Gandhi was visiting the Shastri Memorial. The scuffle on Wednesday broke out after local BJP leaders objected to Congress workers raising slogans like "Gali Gali Me Shor Hai, Chowkidaar Chor Hai". Priyanka Gandhi Drops Holi 2019 Celebration Plan, to Meet Kin of Pulwama Martyrs. The clothes of some BJP supporters were torn in the scuffle. After Priyanka left the area, the BJP supporters gathered and started raised anti-Congress slogans. 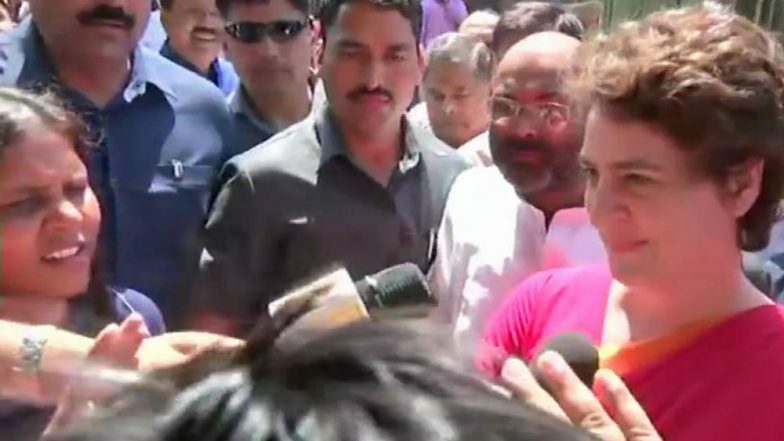 BJP supporters had also raised pro-Modi slogans when Priyanka visited the Vindhyavasini Temple in Mirzapur's Vindhyachal on Tuesday. Earlier today, Priyanka said Prime Minister Narendra Modi should stop thinking that people are fools and understand that they see through everything. Priyanka Gandhi Vadra Attacks Modi Government, Says 'What Happened In 70 Years Argument Has Expired, Now They Must Answer'. “The prime minister has attacked every institution in this country for the last five years, including the institution of which all of you are a part,” Priyanka Gandhi told reporters. “So I think the PM should stop thinking that people are fools and understand that they see through all this,” she added. The Congress general secretary went on to say that she is not afraid of being “harassed”.